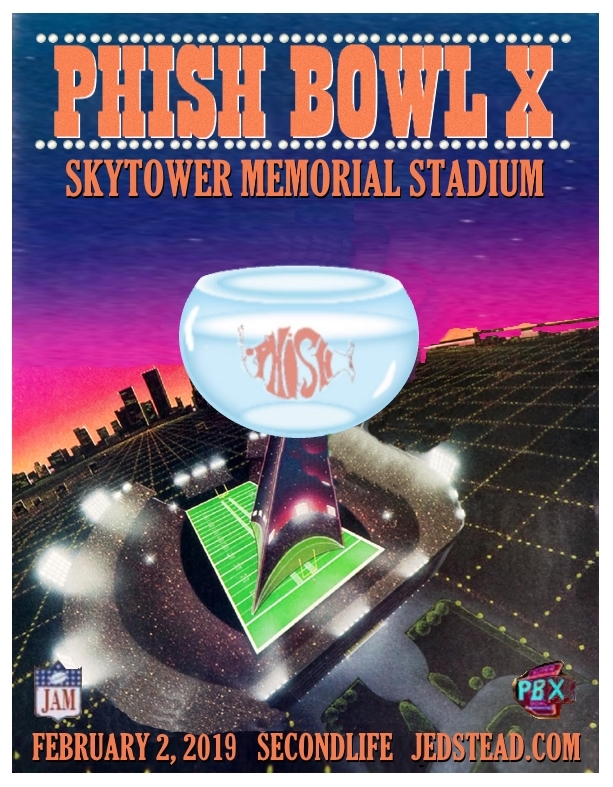 Jedtainment is pleased to present Phish Bowl X, our 10th annual celebration of Phish and the Super Bowl, which will take place this year on Saturday, February 2nd Skytower Memorial Stadium in Secondlife. 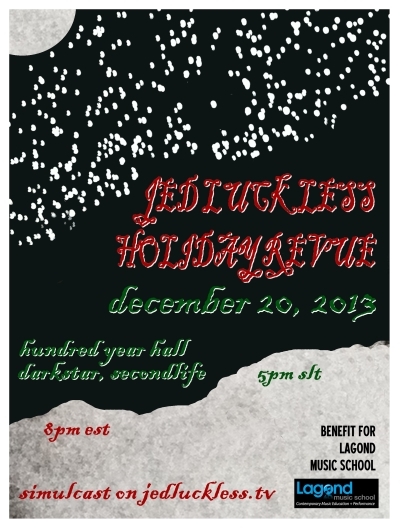 As always, the show will feature two sets of live Phish covers (performed this year by a phresh new band! ), the presentation of the Phish Bowl trophy for best Phish show of 2018, and our exciting setlist box pool! Even if you can’t be there, you can still win prizes! Read on…. Phish Bowl X takes place on February 2, 2019 in Secondlife, on www.jedstead.com and www.mixlr.com/jedtainment. Just like previous years, we continue the tradition of the Set List Box Pool! Phish Bowl X is now in the books! The winning songs were Turtle In the Clouds, Wolfman’s Brother, Sand and Character Zero. Congratulations to all our winners and thanks to everyone who played! See you next year! 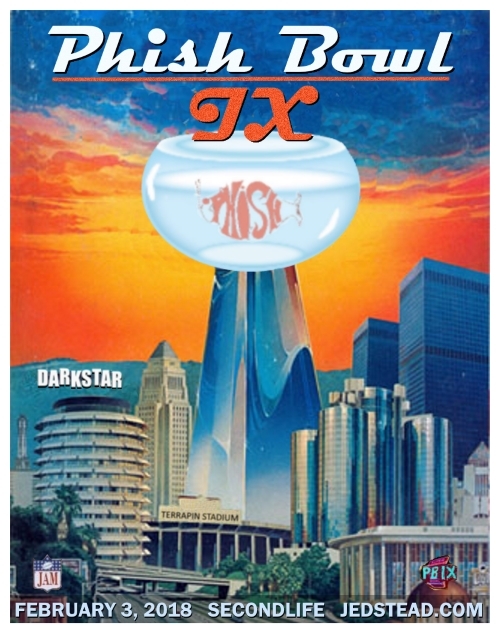 Jedtainment is pleased to present Phish Bowl IX, our 9th annual celebration of Phish and the Super Bowl, which will take place this year on Saturday, February 3rd at Darkstar in Secondlife. 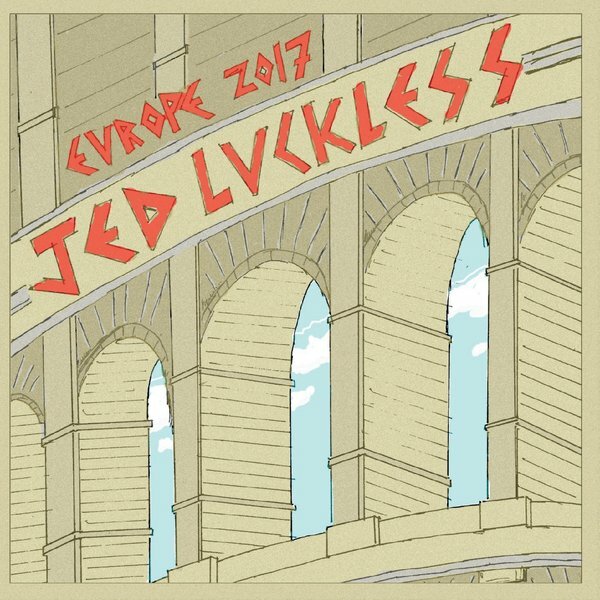 As always, the show will feature two sets of live Phish from Jed Luckless, the presentation of the Phish Bowl trophy for best Phish show of 2017, and our exciting setlist box pool! Even if you can’t be there, you can still win prizes! Read on…. Phish Bowl IX takes place on February 4, 2017 in Secondlife, on www.jedstead.com and www.mixlr.com/jedtainment. Just like previous years, we continue the tradition of the Set List Box Pool! The Phish Bowl IX Setlist Box Pool is over! The winning songs this year were Sanity, Devotion To A Dream, Crosseyed And Painless, and Pebbles And Marbles. Congratulations to all our winners and thanks again to everyone who played! 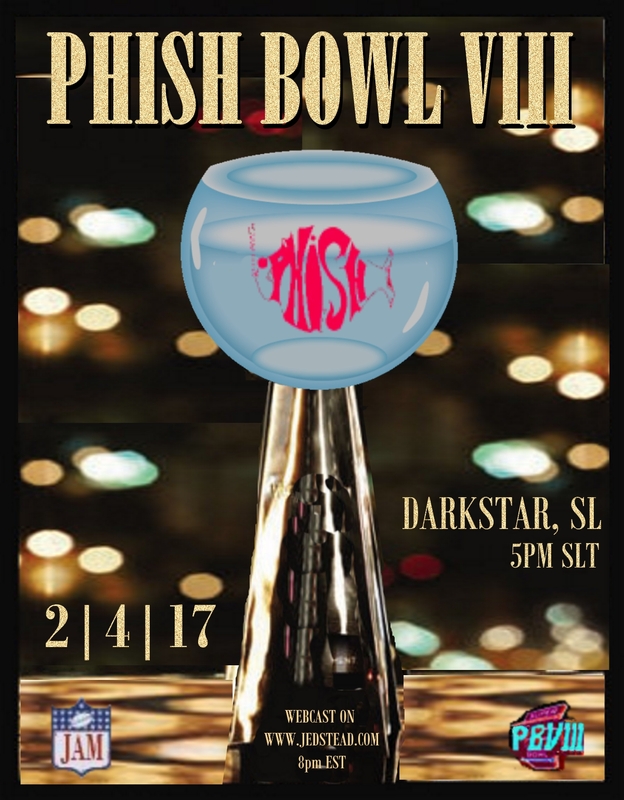 Jedtainment is pleased to present Phish Bowl VIII, our 8th annual celebration of Phish and the Super Bowl, which will take place this year on Saturday, February 4th at Darkstar in Secondlife. As always, the show will feature two sets of live Phish from Jed Luckless, the presentation of the Phish Bowl trophy for best Phish show of 2016, and our exciting setlist box pool! Even if you can’t be there, you can still win prizes! Read on…. Phish Bowl VIII takes place on February 4, 2017 in Secondlife, on www.jedstead.com and www.mixlr.com/jedtainment. Just like previous years, we continue the tradition of the Set List Box Pool! The Phish Bowl VIII Setlist Box Raffle is now closed! Please check the grid for your song titles. Thanks for playing and good luck! For those tracking the odds, last year’s winning tunes were: Party Time, Wolfman’s Brother, ASIHTOS and Silent In The Morning. We are pleased to announce that Phish Bowl VI will take place on January 31st, 2015 at Terrapin “Stadium” on Darkstar! Please join us for our sixth annual celebration of Phish and the Super Bowl! Why: To celebrate Phish and Football! As always, the show will feature two sets of live Phish from Jed Luckless, the presentation of the Phish Bowl trophy for best Phish show of 2014, and our exciting setlist box pool! Even if you can’t be there, you can still win prizes! Read on…. 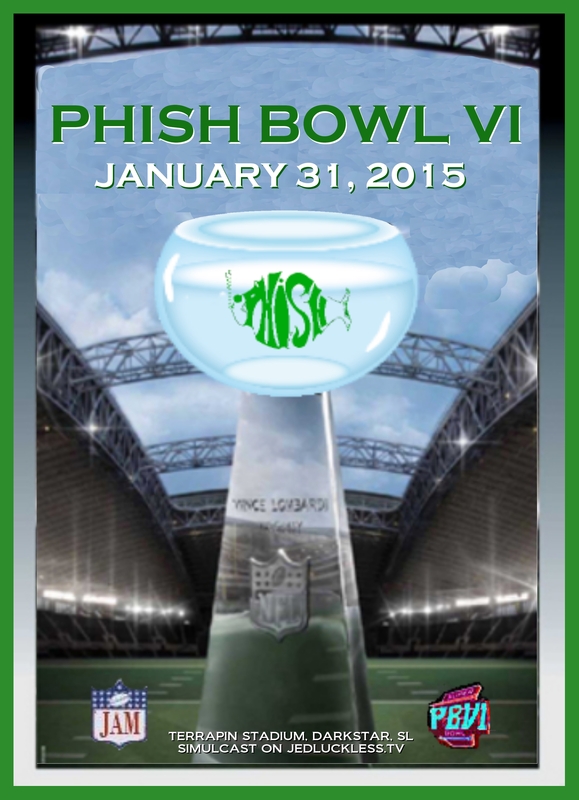 Phish Bowl VI takes place on January 31st, 2015 in Secondlife, on http://www.jedluckless.tv and http://www.mixlr.com/jedtainment. Just like previous years, we continue the tradition of the Set List Box Pool! The Phish Bowl VI Box Pool is now closed! All boxes have been claimed…thank you for your overwhelming enthusiasm! Thanks also to everyone who played the box pool game and congratulations to our four winners Brian Cleaver, Beckka Fredericks, Samantha Chester and Matthew Wallace! For those tracking the odds, last year’s winning tunes were: Gotta Jibboo, Tube, Get Back On The Train and Harry Hood. We are pleased to announce that Phish Bowl V will take place on February 1st, 2014 at Terrapin “Stadium” on Darkstar! Please join us for our fifth annual celebration of Phish and the Super Bowl! As always, the show will feature two sets of live Phish from Jed Luckless, the presentation of the Phish Bowl trophy for best Phish show of 2013, and our exciting setlist box pool! Even if you can’t be there, you can still win prizes! Read on…. Phish Bowl V takes place on February 1, 2014 in Secondlife and on http://www.jedluckless.tv, and like previous years, we continue the tradition of the Set List Box Pool! Boxes are no longer available. Thanks to everyone who played and good luck! Check your song titles below!